In the Spanish and Portuguese market MIBEL, the large volume of wind energy produced in February lessened the price increase resulting from the rise of the demand during the cold snap. The price in Spain in the first quarter was of 50.62 €/MWh, 5.41 €/MWh higher than in the first quarter of 2011, and 46.07 €/MWh in the second quarter, 2.05 €/MWh lower than the price registered in the same quarter of the past year. 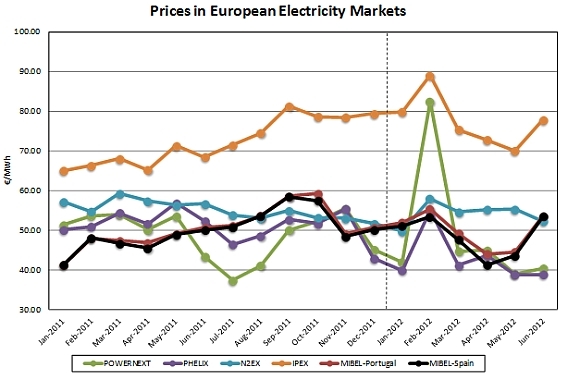 In Portugal, the average prices in the first and second quarter of 2012 were 52.06 and 47.31 €/MWh, respectively, which represent an increase of 6.65 €/MWh when compared to the first quarter of 2011 and a drop of 1.53 €/MWh with respect to the second quarter of 2011. The market that was most affected by the cold snap was POWERNEXT in France, where the average price in February doubled the remaining months of the first half of the year. In some specific hours of this period, the price of electricity in POWERNEXT exceeded 1,900 €/MWh. The average price in the first quarter was of 55.75 €/MWh, 2.76 €/MWh higher than in the first quarter of 2011. However, the price dropped in the second quarter to an average price of 41.38 €/MWh, which is 7.69 €/MWh lower than the price registered in the same quarter of the past year. In the UK, the N2EX market registered an average price of 45.07 GBP/MWh (54.01 €/MWh) in the first quarter, that is, 3.70 GBP/MWh lower than the first quarter of 2011. In the second quarter, the average price was of 43.97 GBP/MWh (54.23 €/MWh), 6.13 GBP/MWh lower than the second quarter of 2011. The average prices registered in the Italian market IPEX in the first and second quarters were 81.23 and 73.48 €/MWh, respectively. These values represented a year-on-year increase of 14.73 €/MWh and 5.16 €/MWh, respectively. The forecast for the French market POWERNEXT in the third quarter of 2012 is an average price of 38.11 €/MWh and 50.91 €/MWh in the fourth quarter. The average price for 2012 is estimated at 46.53 €/MWh. 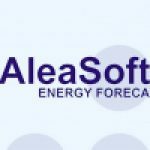 The forecast for the PHELIX market is of 41.68 €/MWh in the third quarter and 46.77 €/MWh in the fourth quarter. The average price for 2012 is estimated at 43.49 €/MWh. The forecast for the third quarter in the UK market N2EX is of 41.98 GBP/MWh and 46.88 GBP/MWh for the last quarter. This forecast suggests an average price of 44.47 GBP/MWh for the year 2012. The average prices in the third and fourth quarters of 2012 in the Italian market IPEX are estimated at 80.18 and 71.37 €/MWh, respectively. This means that the average price for 2012 will be of 76.56 €/MWh. The average price of Brent oil per barrel, which is used as the reference in Europe, in the first quarter of 2012 is of $118.42. This represents a $13.01 rise with respect to the first quarter of 2011. The uncertainty involved in oil imports from Iran due to the sanctions imposed by the USA and Europe and the issues experienced in the import of African oil were the main reasons for this price rise of Brent oil during the first quarter. The uncertainty involved in the evolution of the Eurozone economy, the high production of oil by OPEP countries and the announcements made by the International Energy Agency regarding intervention in the event of prices rising any further provoked a drop in the price of Brent oil per barrel in the second quarter, which registered a quarterly average of $108.84, $8.27 lower than the same quarter of 2011. Likewise, the prices of Zeebrugge and NBP gas increased considerably at the beginning of the year due to the rise in demand resulting from the low temperatures experienced throughout the continent in February, and they closed the first quarter with quarterly average prices of 23.05 €/MWh and 20.08 GBP/MWh, which entailed a rise of 0.33 €/MWh and 0.65 GBP/MWh when compared to the first quarter of 2011, respectively. The rise in temperatures and the increase of gas storage curbed the price rise of Zeebrugge gas (24.27 €/MWh, 1.70 €/MWh higher than the second quarter of 2011) and even caused a drop of the average price of NBP gas to 19.51 GBP/MWh in the second quarter. 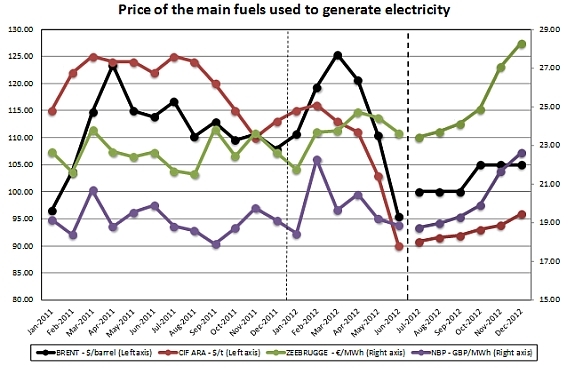 The price of CIF ARA European coal experienced significant drops during the first half of 2012. The first quarter registered an average price of 114.64 $/ton, 5.98 $/ton less than the same quarter of the past year, and the second quarter registered 101.35 $/ton, 21.99 $/ton less than the second quarter of 2011. The main reasons for these drops in prices are the excessive offer and the low demand currently existing in Europe and other industrial powers such as China. The weakness of the Euro against the dollar and the deterioration of the economic situation and outlook in Europe have also contributed to the drop in prices of European coal. In the second half of the year 2012, the prices of the Brent barrel and European coal are expected to rise slightly. The price of the Brent barrel is expected to reach $105 and the average price of CIF ARA coal is expected to hit the 94.24 $/ton mark in the last quarter. With regard to the price of gas, considerable rises are expected up to the end of the year. The quarterly average price of Zeebrugge gas is expected to rise up to 26.74 €/MWh and the NBP gas to 21.39 GBP/MWh. The price of CO2 emissions rights(EUA) reached 7.87 and 7.04 €/ton in the first and second quarters of 2012, which represent a 7.46 and 9.30 €/ton drop when compared to the same quarters of 2011. The price drop of the Brent barrel and the uncertainty of Phase III in the emissions market are the main reasons for the sustained price drop of the EUA with respect to 2011. However, the price became stable during the second quarter in spite of the pressure experienced by the forecasts on the economy’s evolution. 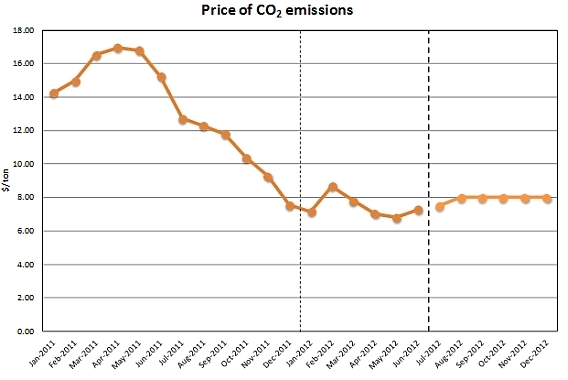 The forecast for the second half of the year 2012 is that the price of emissions will remain around 8 €/ton.